First i wanna tell a special someone..
view this!! 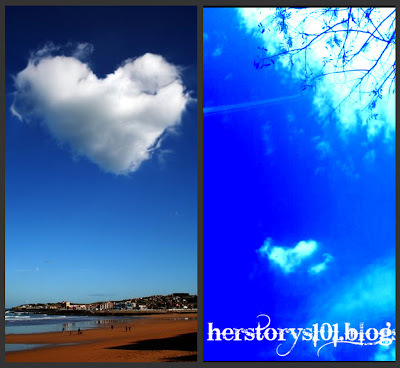 is one of my blog post..
i said i wanted to see a heart shaped cloud like this one day..
n guess wat!!!!!!! i did!!!!!!! the pic on the right!!!!!!!! i took it!!!!!!!!!! yes!!!!!!!!!! me!!!!!!!!!!!!! yay!!!!!!!!!!!! i'm so happy now!!!!!! i noe is not as nice as the left one but still..
that i get to see it with my own eyes..n snap a pic of it!!!!!! ok..i was actually in the car..waiting for my parents..
den when i look outside the window..
hehe..i have more to show u..
but anyway..really happy for my cousin brother..
when i was sitting quitly at his wedding dinner..
is just funny that i'm there..
maybe is because when we were all still really young..
i remember me my brother n him..
i miss those time with him..
n now his married..times really do flys..
not sometime!! all the time..
cant believe i'm gonna b 16next year!! is not a bad thing to grow up but it sure scares u sometimes..
having all the pressure on responsibility..
the place is so freaky! !n only me n my mum went dat nite..
the carpark!! the mall!! is so old!! n just EWW.. IT WILL FREAK U OUT!! ok..jo say is called Bintang? ok wtv is freaky..don go der..u'll hav nitemare at nite..
his dad is an amazing singer..
so that nite someone actually sign up for him to go sing a song..
he looks good tho..handsome..DUH!! is his wedding..==. mum thinks she's feeding a pig..==. look! !nearly half of the fish!! o yea!! do u noe everytime someone gets married..
they have this long red firecracker thingy..
ok so..at first this dog was barking like nobody business..
n when the firecracker was done with its awfully loud singing..
everyone felt a sudden silent..
so we look over to the dog..
well,we were all eating out..
n is so much better den eating under the red cover thingy..
n one more thing!! YOUTH CAMP is just around the corner!! i cant wait to see everyone in church!! o yea! !n the camp is called..
i cant wait!! i'm actually using joanna mum laptop..
n back home this sunday..
haha..just glad i'm not home for one whole week..
is such a waste of time staying at home with nothing to do..
u'll feel seriouly really lifeless..
but not anymore for me!! so don ciu readers go away..